I wish I would have decorated the nursey when Cooper was a baby. Most people think when they decorate it involved shopping and lot of painting. What about art work that all you need to do is frame? lil Helper has the solution, Nursery Art. Fits in an 8×210 frame and can bring life into your nursery. Make your babies room colorful and visual stimulating. 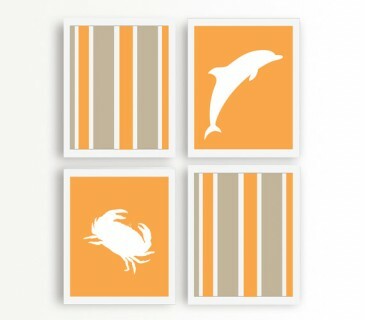 I love the the orange pattern of the Dolphins and Crabs. Do you have a little on the way or haven't gotten around to decorating? lil Helper is giving you the chance to win a pattern of your choice. lil Helper is all about bringing cloth diapers to parents. Apart from providing parents with a greener alternative to disposable diapers, Lil Helper also started the Baby Do Good program, which gives a brand 1 brand new cloth diaper to a family in need for every 3 diapers they sell. It is their way of evangelizing parents to sustainable diapering practices. I LOVE companies that give back! I love the orange dolphin set but I am entering for someone else as I know they would love all of them. I like tthe Number Art print! I'd go with the number art in orange. I like the I like the Float & Anchor prints. Thanks so much for the fantastic giveaway! I would pick Beach Room in pink. I love the washroom commandments! I'd choose the washroom commandments! I'd pick the dolphin and crab set in blue. I would love the float and ancor for my boys! I would get the Dolphin and Crab prints! I like the LOVE print. I like the Dolphin & Crab print set.